Buying our first home had lead to a lot of other firsts for us. One of those firsts is buying appliances. A new refrigerator, washer & dryer to be exact. Fun and stressful, we started our process doing lots of online research and price comparison before hopping in the car to hit the stores on Memorial Day. We kept our hunt to the two stores closest to home, Best Buy & Home Depot. Since we had done our research already, we did not need to spend days driving from place to place to get what we wanted. We ended up going with Home Depot since the prices we comparable and they were offering interest free financing and a nice discount on the washer and dryer set. 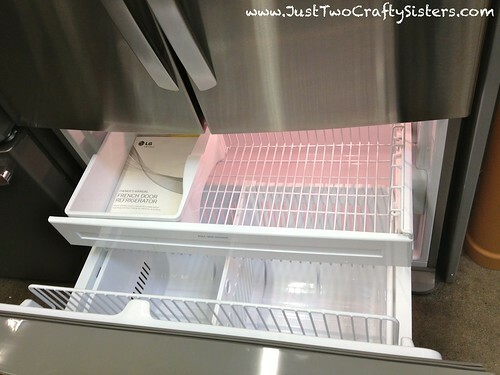 Our main requirements for the refrigerator was to find something for under $2,000 that would fit in the space constraints in either stainless or black. A lot of the ones we looked at were an inch or two too tall to slide under our cabinets. 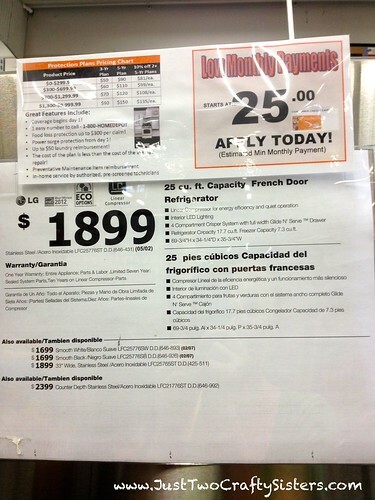 We finally found this LG model at 69 3/4″ height which we hoped it would just slide under our 70″ clearance space. And at a sale price of $1,899, it was right on budget. Plus I loved the french doors to make it feel a lot more open and spacious. Compared to our apartment fridge, this was amazing. It ended up being a really good thing that we went with french doors, since it is close to a wall on the right side, that door only opens about 90 degrees and without the second door opening fully it would make it way to tight. 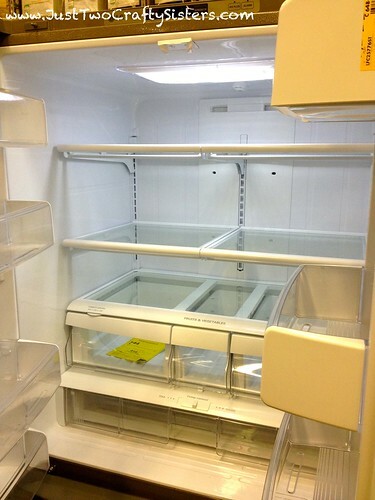 I have never had a refrigerator with the bottom drawer freezer, but this is pretty awesome too! 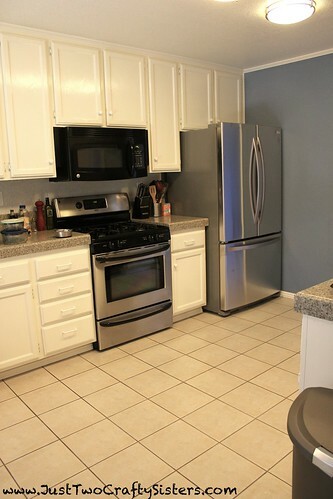 It’s a snug fit, but it just slipped under the cabinet with no room to spare and looks great with the other appliances. One problem we are now realizing is how easy the finish gets smudged dirty fingerprints on it. If you have kids or are a perfectionist when it comes to a clean look, you may want to go with a different finish. 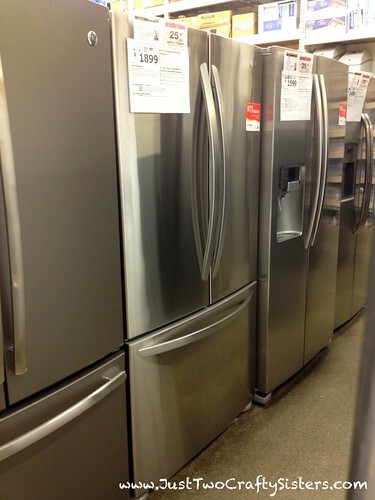 After the fact we saw a sweet matte silver fridge that might make a nice alternative too. 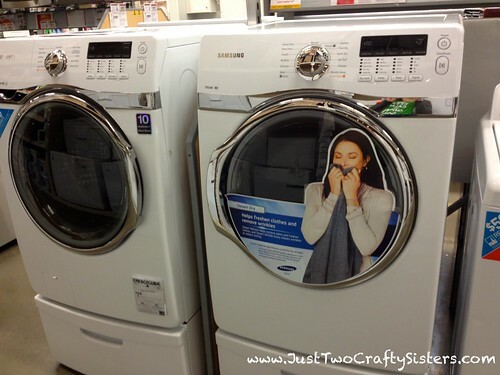 The decision on our washer and dryer was made up in store based on the great deal we saw. 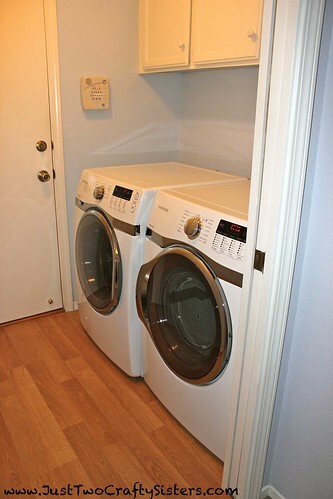 I love the look of front loading machines and have this vision of a tiled wall behind the washer and dryer and a nice wood table top to fold close on top of the units. Going into the store, I had settled on the fact that it was too expensive to get the look and we planned on the top loading unit. Low and behold, these beauties are on sale for only $100 more that the top loader so I get my beautiful front loaders after all! !